My friends you can scream run,run, run but snails are just slow! For some there is the night ritual with torch in hand to find and get rid of these “little” creatures munching on lettuce, cabbages and other veggies ,and finding them on the delicate foliage of freshly planted flowers. 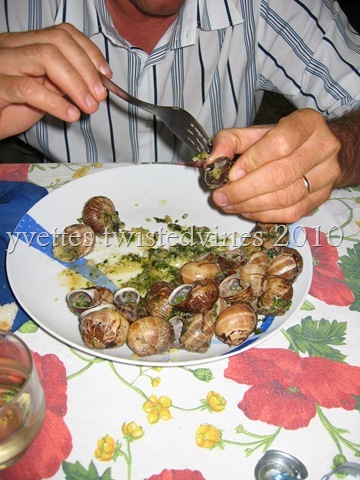 However, from the south to north of Italy there are over 400 fairs and festivals where the main attraction is indulging in the “delicate” eating of snails. We too take part in this ceremony, and not once but twice this year we’ve enjoyed with friends a dinner of snails and Prosecco. 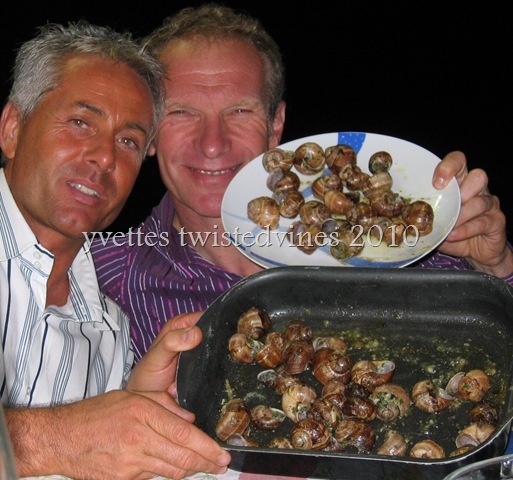 These “boys” have been friends forever…and each dinner was a race to see how many they could find and later eat…this round fifty snails. However the traditional cook was my sister in law. Who has made her mark as the all round top chef in cooking these slippery little suckers. 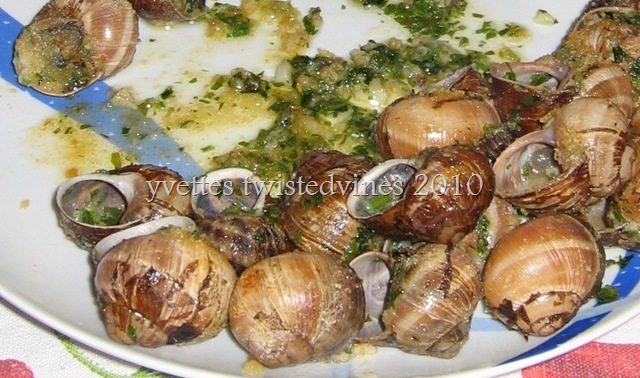 Her recipe is the traditional “ Lumache alle bourgiognonne” Snails cooked in butter,breadcrumbs and a variety of fresh herbs, parsley,sage,thyme. To be able to enjoy snails with secured calmness ( as the slugs can contain harmful substances) it’s necessary to complete the cleaning process. It takes time and patience but secures the enjoyment of the rich flavour, of each snail. The cleaning process takes from 4-5 days, boiling them in salted water and vinegar, changing the water and repeating the process 2 or 3 times. Then boiling the snails for at least 2 hours in a pressure cooker. At this stage they can be frozen. If not there are many traditional recipes or even a few new ones. Some of the recipes with snails are fried snails with cornmeal (polenta), soup of snails (very creamy),ravioli of snails and tagliolini (pasta) with a fried snail sauce,kebabs of snails with a herb dressing,the more traditional herb crusted and baked in butter (alla borgognona) which we enjoy and finally snails baked with a tomato and herb sauce. 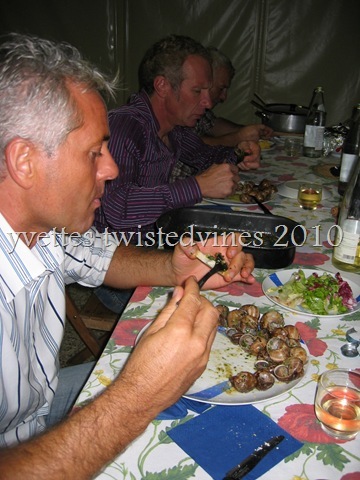 I love the photo of them eating snails not that i would be game enough to help them but my dad said he would! !You have made such a good job of your site it looks great! Ciao Angi, I loved that you left a comment…you’re welcome anytime, you know that..
call in and have dinner with us all!We miss you! I think I would like to try a snail… Of course, we don’t have a lot of those in Oklahoma for some reason. Thanks for your sweet worlds on my blog. Oh I looooove snails! Thanks for sharing, Yvette! 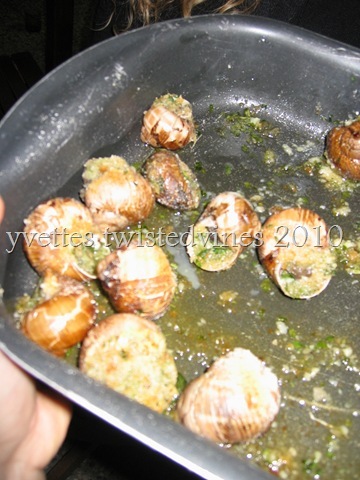 When I was little my parents used to get together with their best friends for a dinner of snails. My Dad always cooked them in butter and garlic, which smelled good but I was never brave enough to try them! Amanda:Slippery little suckers..that memorable scene from “Pretty Woman”! Celia:Happy there’s a few of us who have tried them! Andi:The perfume of butter and garlic is just sooo delicious! Next PostA Hunting we will go….